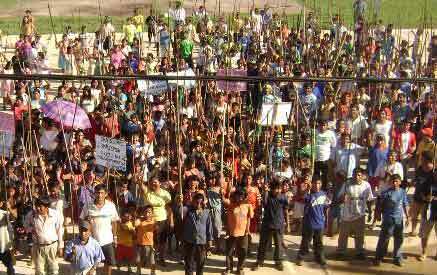 The Awajun and Wampis people in Bagua, Peru, recently detained employees from the Canadian mining company IAMGOLD. According to statements from AIDESEP, the company did not have any authorization to enter the territory. The employees, five in total, were arrested in protest of the fact. The workers were identified as Victor Raul Lipa Salas, Eduardo Duffó Victor Ochoa, Julio Alberto Cajo Manayay, Wilson Wilman Diaz and Felipe Barrios Llambo Gavidia. Another three workers from Dorato Resources Inc., another Canadian mining company, were also detained. The action comes three months after Dorato Resource also illegally entered the Awajun and Wampis’ territory. At the time, Peru’s congress had just decided to repeal two of the controversial laws that led to 90 day mobilization which culminated on June 5 in Bagua. There is, however, one major difference between Dorato and IAMGOLD’s excursions. Only Dorato had the government’s permission to enter the Awajun and Wampis’ territory. According to Peruvian Ministry of Energy and Mines, IAMGOLD did not. Felipe Ramirez, a Director for the ministry’s Environmental Affairs office, recently stated that IAMGOLD hasn’t even so much as asked the govenrment for a permit to mine or explore for minerals in the region. “What they are doing is illegal,” the official stated. IAMGOLD denies any kind of wrongdoing on their part. In fact, they’ve even gone so far as to say that one was arrested. Instead, the company alleges, the group of employees were on “the property of a willing third party individual,” when they were told to leave, presumably, by the Awajun and Wampis. Being noble protectors of good will and justice–something all Canadian companies are professing to be these days—the employees conceded to the Awajun and Wampis request, picked up their gear and left. Regardless of what actually happened here, the fact is IAMGOLD should have never been on the Awajun and Wampis territory. And they would have stayed there if they were never confronted. In effect, it is one brief example of how Canadian companies routinely operate in Peru and in dozens of other regions around the world. These companies go to great lengths to portray themselves as both victim and faultless champion, while disregarding even the most basic laws, human rights, and so-called voluntary corporate social responsibility (CSR) standards.